This week see a new exhibition published on the Art In Wax website. The theme of this exhibit is one of my favorite flowers – Sunflowers. I recently bought a bouquet of sunflowers and had taken photographs to paint from, I don’t tend to look at the photographs while I am painting. 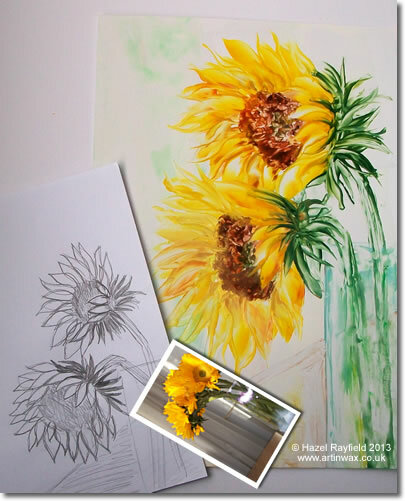 I make sketches from the pictures and then using these sketches to look at as a guide to placing the blooms and depth of the picture I paint the flowers directly with the wax onto the gloss card. This process of working gives an impressionistic feel to the paintings as much of the painting come from my imagination as I work with the hot wax. I am showing some of the photographs in the exhibit, these demonstrate the collection is based more on the similarities in the photographs rather than actual copies. Throughout time sunflowers have been a popular subject for painters and artists. One of the most famous being that of Vincent van Gogh and his vase of sunflowers. Bouquet of Sunflowers by Claude Monet in 1881 an oil on canvas paintings is one of my own personal favorites and “Three Sunflowers And A Bottle of Water” 1996 by David Hockney has such a different and yet vibrancy I just had to mention it too. This series of paintings was great fun to paint and has taken several weeks to complete, I used various tools in the process. All pictures are approximately A4 (29 x 21 cm) in size and create on encaustic gloss card using encaustic coloured wax. Whilst painting this collection I have made a short video diary showing some of the techniques use in the process ……..
You can watch this and a demonstration of me painting a smaller hot wax encaustic sunflower via the Art In Wax Youtube Channel or below in this blog post. Please leave me a comment if you liked the exhibit and /or the video diary. 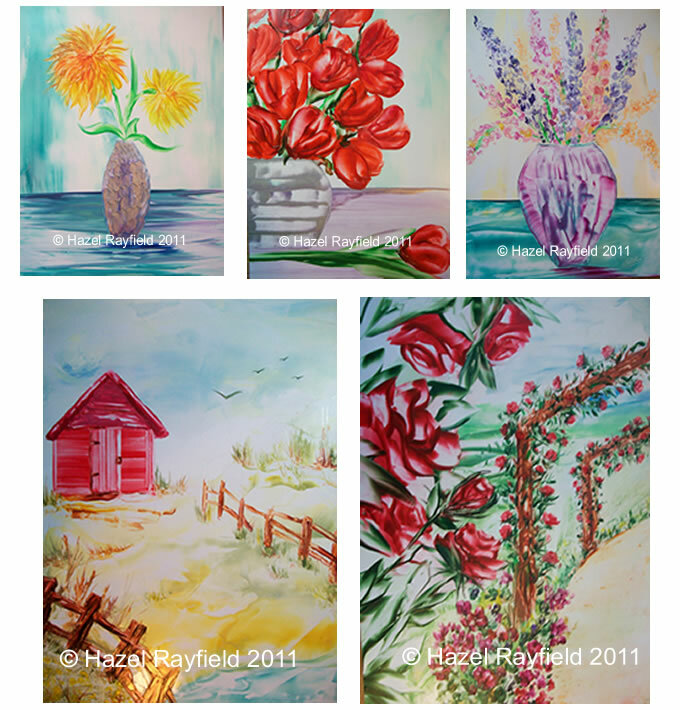 Paintings from this series maybe for sale, please contact me Hazel Rayfield direct for details. Due to the amazing response I have had to my art since putting it online from the Summer this year and the success of the Art In Wax website, together with such fabulous feedback on my encaustic paintings that have been sold, I have been working on, and am still working on, a new collection of paintings to go online at the beginning of the new year. They range from the A5 size vases of Delphiniums, Chrysanthemum and Tulips, to an A3 Beach Hut and Rose Arbour Walk ……. The Art In Wax online gallery will be expanded in the new year and be spread over more pages with sections for the categorises to make indexing and navigation easy. Adrian and I have been working on the Art In Wax website this week, and it is finally finished – for now! 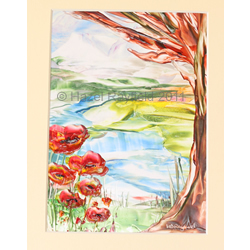 The website is designed as a place for me to show and display my artwork in an online gallery, to find out more about me please visit the about Hazel page. The art gallery shop has an array of new paintings, photographed by Adrian and now online. I have added a page about encaustic art, which I will expand on over time, there are also some useful links in the page including one to encaustic.com where I get most of my supplies from and a website with lots of information on painting with encaustic wax. The encaustic art gallery will expand as I create more paintings, I am working on some larger A3 pictures, one of which was finished this morning and is ready to be mounted. I also intend to add an exhibitions page soon, this will be a place that will change periodically and where I will feature paintings on a theme. So this may be the launch of the artinwax.co.uk website but it is by far not the finish!